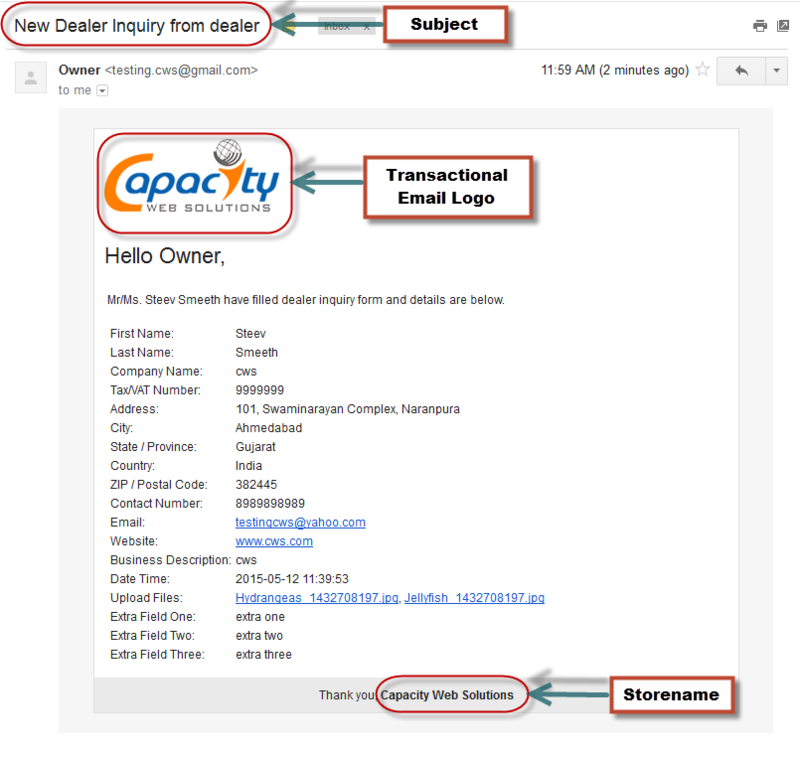 Able to create customer from admin with single click based on dealer details. Owner and Customer get notifications through email. Allow to customize email template format and manage from configuration. Allow to use custom URL key and also manage label for top link. 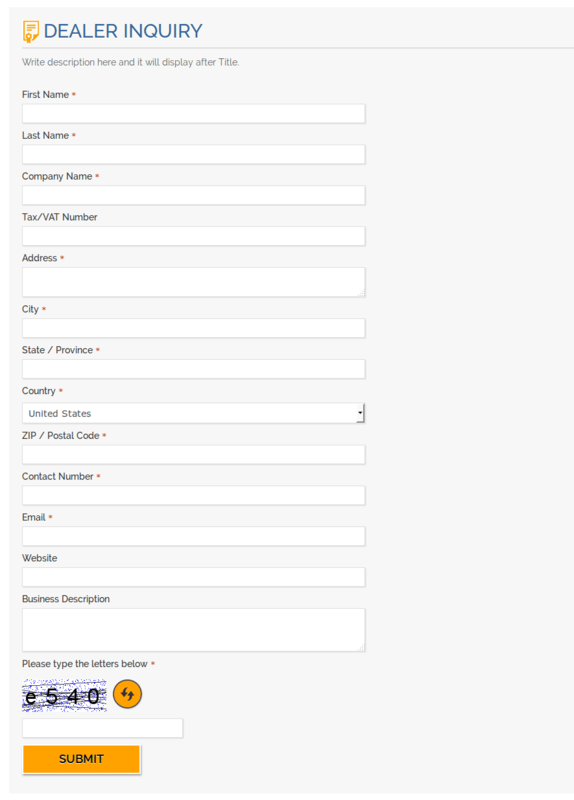 Customize inquiry form fields and labels. Used captcha validation in inquiry form. 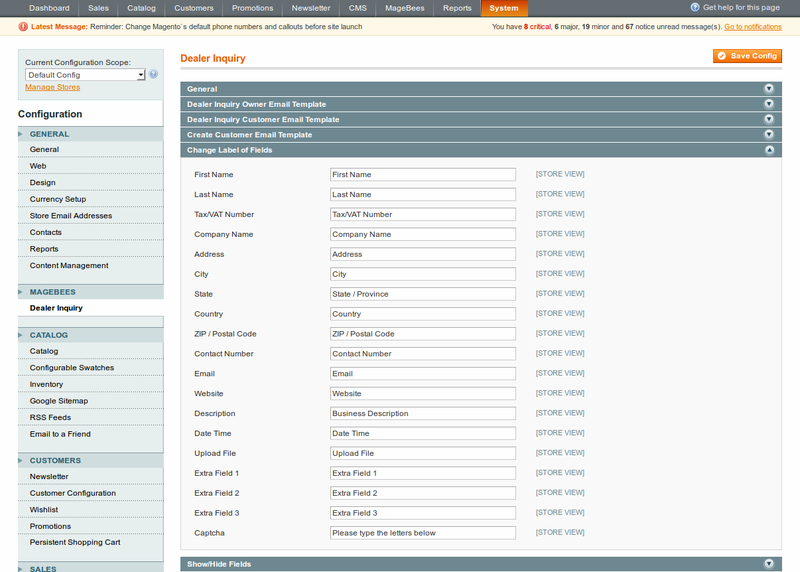 Magento Dealer Inquiry extension is very helpfull for setup dealer inquiry features into your store. If you are wholesaler or distributor then you can use this extension. You can use this extension for inquiry forms of your website.Our extension is easy to setup and give many options for settings from admin. Manage inquiry details from "Dealer Management" Section. Create customer from Dealer Inquiries page. 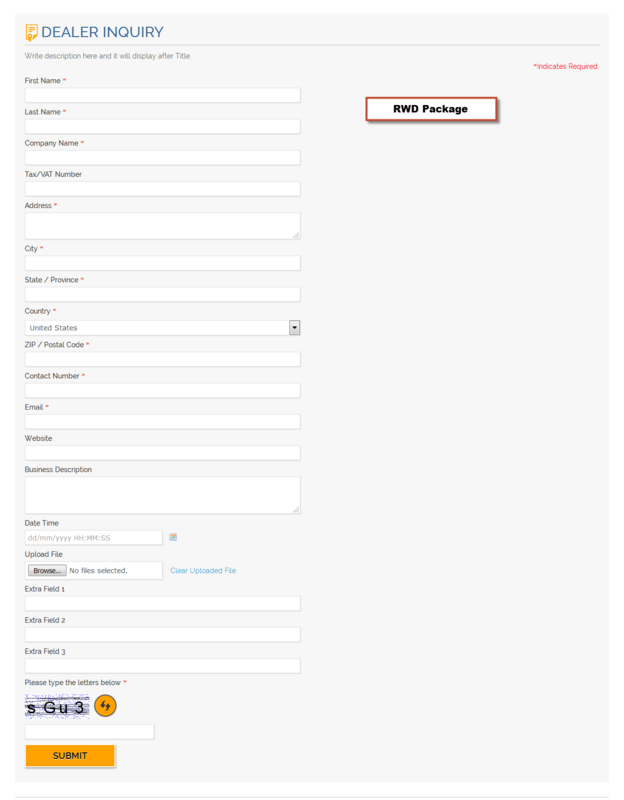 Customer can get registration details by email which have auto generated password. 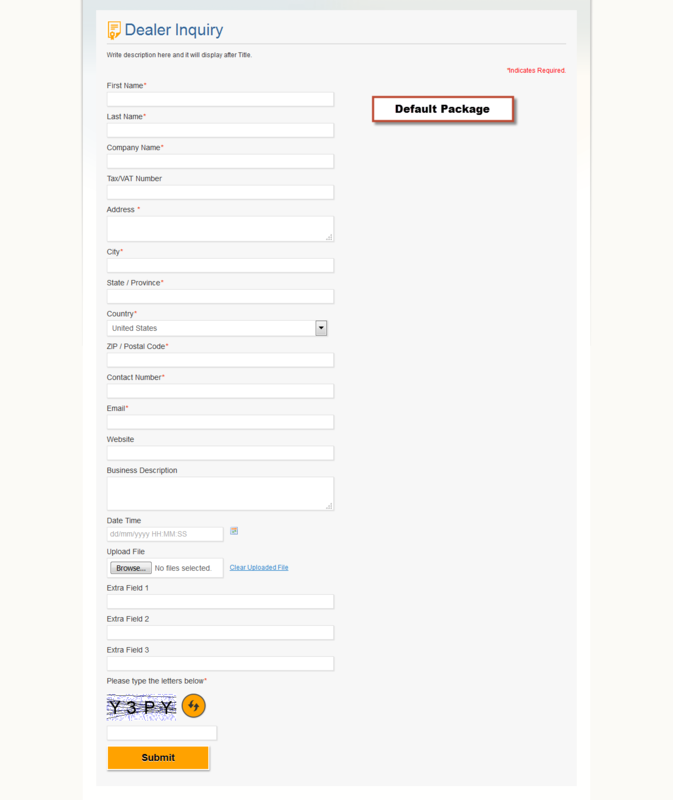 Enabled/Disabled form fields and set labels of form fields, page heading, page description, top link, email subjects. Able to select different customer group for create customer from configuration. Well designed inquiry form, supported responsive theme design. Customer/Dealer can get registration details by email which have auto generated password. Required fields for dealer details and captcha validation to form. Used magento templates for email and also can select custom template. Fills in as depicted - an extremely basic result, yet for a free item I could not request more. Extremely glad, exceptionally prescribed. This extension has extraordinary features! Brilliant developer support.Thanx. I am utilizing this extension. This is exceptionally useful to us. Satisfy all our requirements for set up Dealers account. This extensions was exactly what I needed, with a little twist - i needed just one extra feature. It had installed correctly, working just as it was supposed to, and the support helped me with directions to implement my extra feature within 8 hours, which I think is great for a free extension. I recommend it to every one of you! This extension has great features! The extension works as described. The support team provides very fast and excellent support.I would like to thank the developers for this extension.Good job! I installed this extension on our website (Magento 1.7.0.2), it works as described and the customer support is excellent. Added dependent drop down for select region based on country. Bug fixed for date picker field in Chrome Browser. Added new features and also support security patch SUPEE-6788. You can set Meta information for inquiry. Now you can set custom URL key store wise. This version Supported security patch SUPEE-6788. 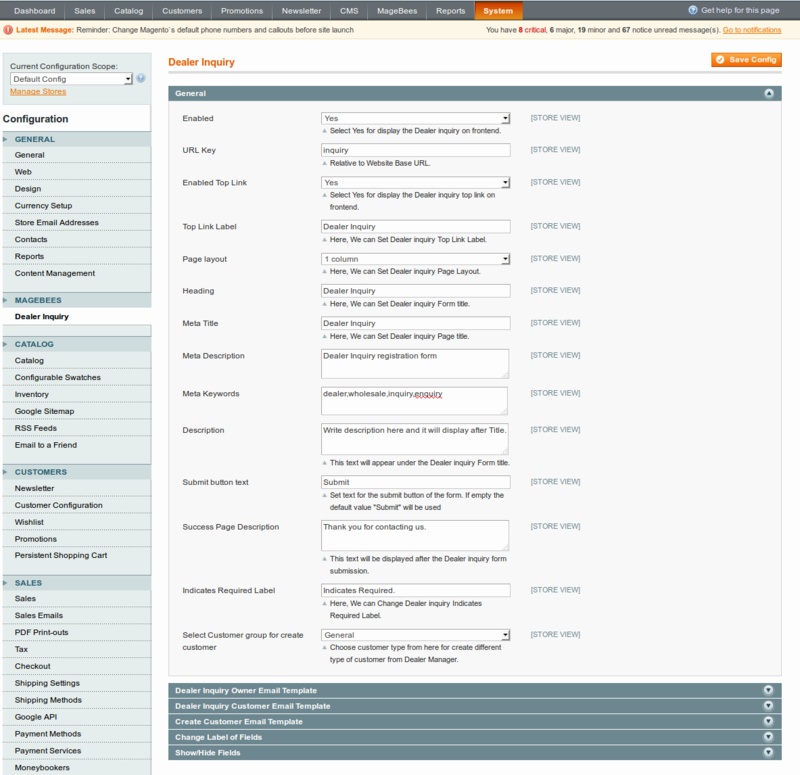 Add Useful Options in the configurations for change page layout and email section. Set page title from configuration. Option for set page layout of dealer inquiry form. Option for select owner email and able to add custom owner email address. Option for Enable/Disable Top Link. You can select different customer group for create customer from configuration settings. Upload multiple files and file type validations. Three extra text box fields. 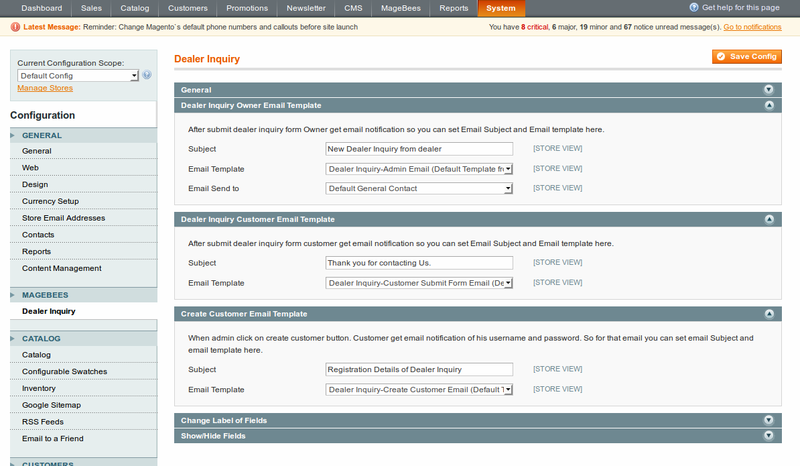 Used magento templates for email and also can select custom template from admin. Use Magento Grid for Dealer Management Section. Display store wise view dealer details. Option for include jquery library from configuration. Option for set top link text from configuration settings. Admin can change Indicates Required Label value. 1) Fixed Magento Connect Installation Error. 2) Fixed Database issue occur for some language store. 1) Fixed admin email template state field issue. 2) Fixed Tax/Vat field enable disabled issue. Fixed Dealer Inquiry Link issue for Responsive Design ( rwd package). Manage labels text , hide/show fields and Captcha added. 2) Admin Change Email template Subject and Descriptions. 3) Captcha code added on dealer inquiry form. 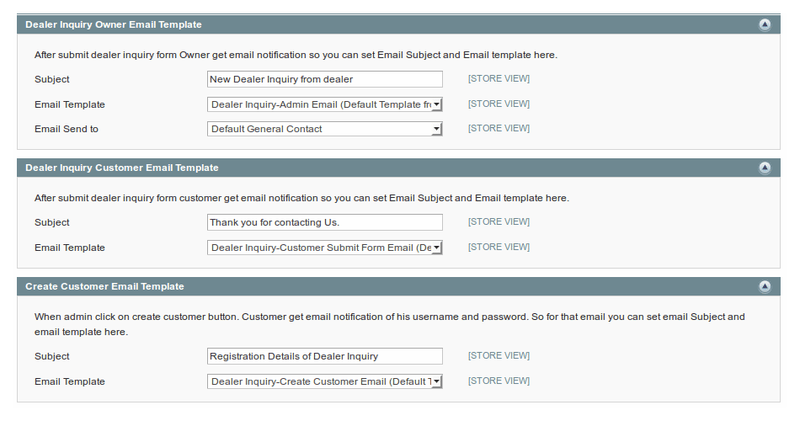 1) Admin can create customer from Dealer Inquiries page. Customer can get email of his username and password. Password is auto generated. 3) Changes in Dealer Inquiry Spelling error. This extension is providing inquiry form. Dealer filled the details like name, address, contact number, email, website and description inquiry form. It informs to customer and admin by email when customer submits inquiry form. 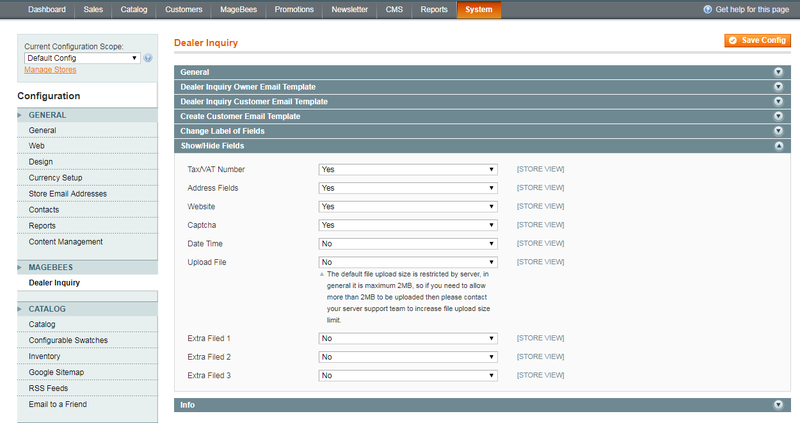 This extension also provides customer listing who submit inquiry form in admin under “Dealer Management “section. You can view inquiry details of customer and also delete the inquiry information. This extension provides create customer link from dealer listing page. System => Configuration => CUSTOMERS (tab on left side) => Customer Configuration => Name and Address Options (tab) => Show Tax/VAT Number and set the value of it as per your requirement. Q-1 :I have Installed Dealer Inquiry Extension. But when I click on Dealer Inquiry Tab in the config page will get a 404. :(. Ans : After installing Dealer Inquiry Extension. Please Logout from admin account and Re-login and Refresh Cache. 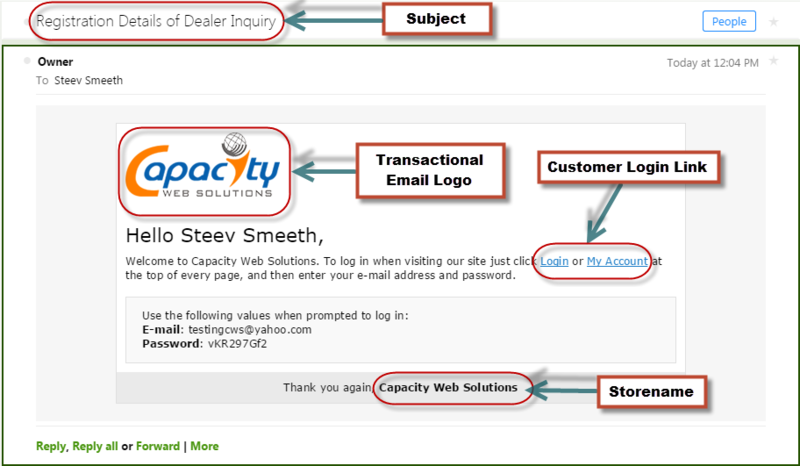 Q-2 :How to use Dealer inquiry Extension in other themes ???? Step-1 : Copy "inquiry.xml" file from <SITE ROOT>/app/design/frontend/base/default/layout and put it in to your <SITE ROOT>/app/design/frontend/Your Package/Your theme/layout/ file. Step-2 : Copy "inquiry" folder from <SITE ROOT>/app/design/frontend/base/default/template and put it in to your <SITE ROOT>/app/design/frontend/Your Package/Your theme/template/ folder. Step-3 : Copy "inquiry-icon.png" image from <SITE ROOT>/skin/frontend/base/default/images/ and put it in to your <SITE ROOT>/skin/frontend/Your Package/Your theme/images/ file. Step-4 : Copy "refresh.png" image from <SITE ROOT>/skin/frontend/base/default/images/ and put it in to your <SITE ROOT>/skin/frontend/Your Package/Your theme/images/ file. Step-5 : Copy "inquiry.css" file from <SITE ROOT>/skin/frontend/base/default/css/ and put it in to your <SITE ROOT>/skin/frontend/Your Package/Your theme/css/ file. Step-6 : After successfully Copy File & folder you need to clear/refresh all your cache. 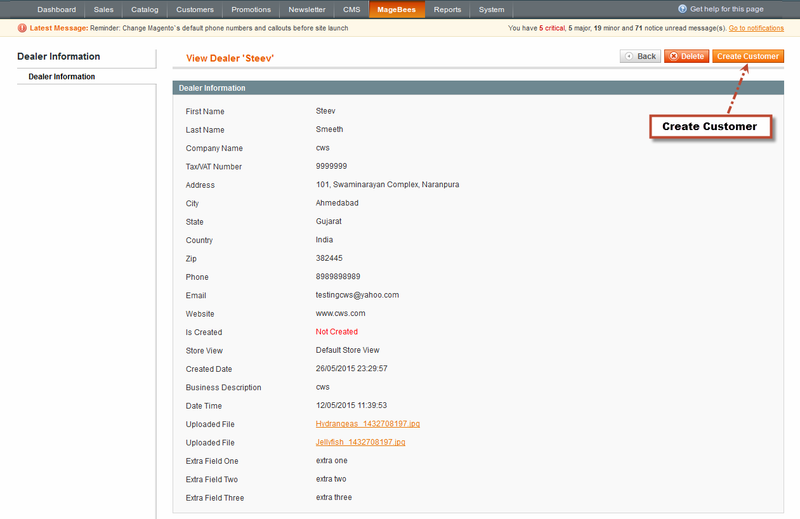 Step-7 : Now Check Dealer inquiry Extension on Front-end. Q-3 :I have installed Dealer Inquiry Extension.But When I click on Dealer Management menu it will show database table error. Go to your store database. Check “delerinquiry” database table exits or not. If you not found table then click on “core_resource” table and found “inquiry_setup” value. Remove “inquiry_setup” entry and reinstall this extension. Q-4 :Store Name not displayed in email. Specify store name in Store Information Section as per display in following screen. Q-5 :We have implemented dealer inquiry extension but admin did not get mail when customer submit the dealer inquiry form.Can please let me know how admin can get the mail. Go to System → Configuration → General → Store Email Addresses Tab. Please specify Sender Email in General Contact Section for get admin mail.